In the midst of my 2017 organization overhaul, I’ve been motivated to simplify some of my decor. When I took down all the Christmas, something happened- everywhere I looked, everything in my house just seemed so heavy. I’m in major purge/sell/donate mode and have started looking for simple ways to update and freshen some of the rooms in our home. The first space that was screaming for me to lessen the visual load- my breakfast nook. With one simple switch (and a little “shopping” in the basement), it has a lighter look to match that transitional style I’m drawn to. Over the past year, through subtle changes, this room has seen a gradual transformation. 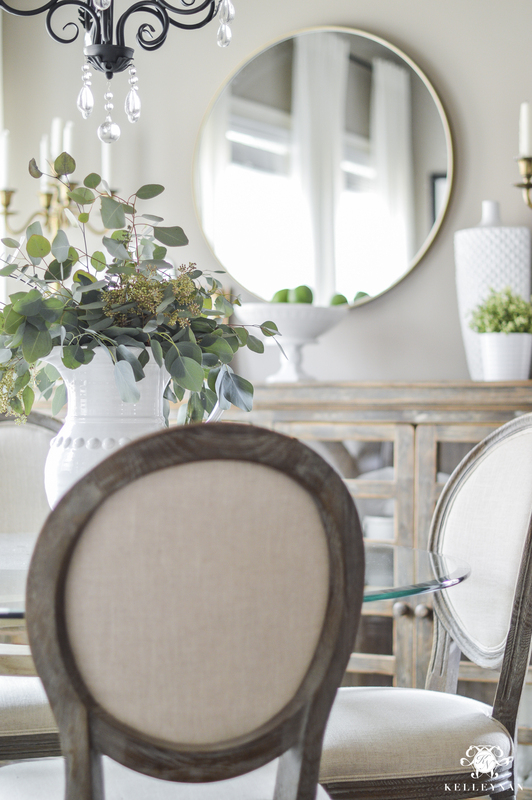 Read on for the evolution of the updated breakfast nook. If you have been with me a while, you may remember, this is where I started. Then, last spring, after switching up the chairs (HERE) (I finally sold the old set this weekend- whoop!) and giving a face lift to the table (HERE), this is where we were. Don’t get me wrong- I loved this look. But, I was looking at that mirror every day thinking, “This just doesn’t feel like me anymore.” I needed a change – a simple, inexpensive change. 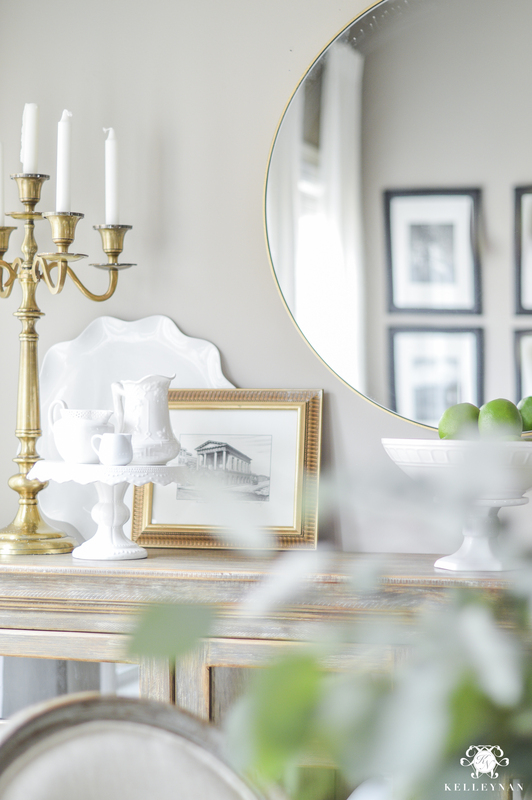 A few months ago, I purchased a round mirror with a barely-there brass frame. I had no idea where I was going to put it but I brought it home and shoved it in a closet. PS: I don’t advise doing this- more often than not, those items typically sit in the closet without ever getting a permanent home. If you don’t use it in the first month, take it back. So, this past weekend when my husband headed out for the Falcons game, I set my plan in motion. I should mention- Dave doesn’t typically resist my “grand plans” but when I can save him from actually seeing the process, I do. If he had actually seen me in action on this day, a simple mirror change would have looked more like a full room renovation haha. I took down the mirror, cleared the buffet, and brought out my new “weapon” that had been hibernating this winter. I went ahead and hunted down some spring accents in the basement to go with the lighter vibe I was aiming for, and this is the final result. The simple, round shape of the mirror with the thin frame made all the difference. 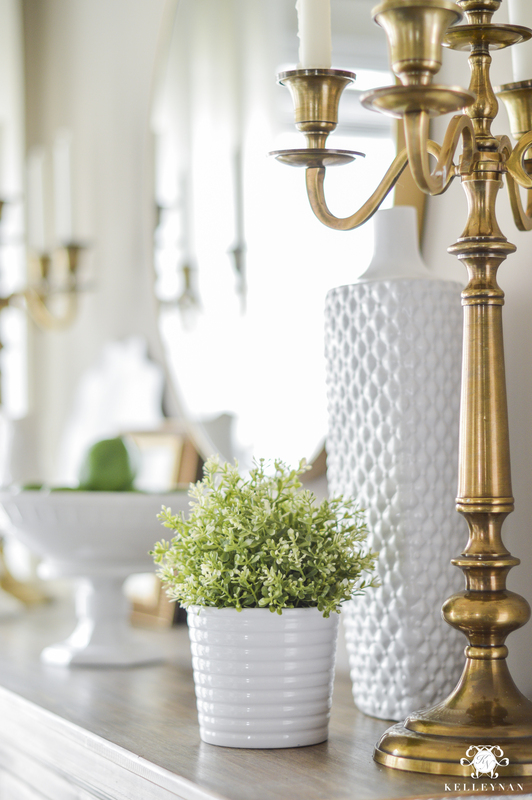 I kept a few fav white pieces on display and of course, my brass candelabras (stay tuned for a super fun, different table which uses those as the focal point, coming in two weeks!). I brought out a sketch of my fav city, Charleston (read about our recent weekend trip HERE) that never actually had a “home”. Eucalyptus is my fav, inexpensive statement; I wish I could have it in my house 24-7 but I have to drive almost an hour away to pick it up at the closest Trader Joe’s. I would love to hear your thoughts on the big switch- from a heavy, French Country inspired mirror (which I also sold this weekend *fist bump*) to this light, modern round piece. 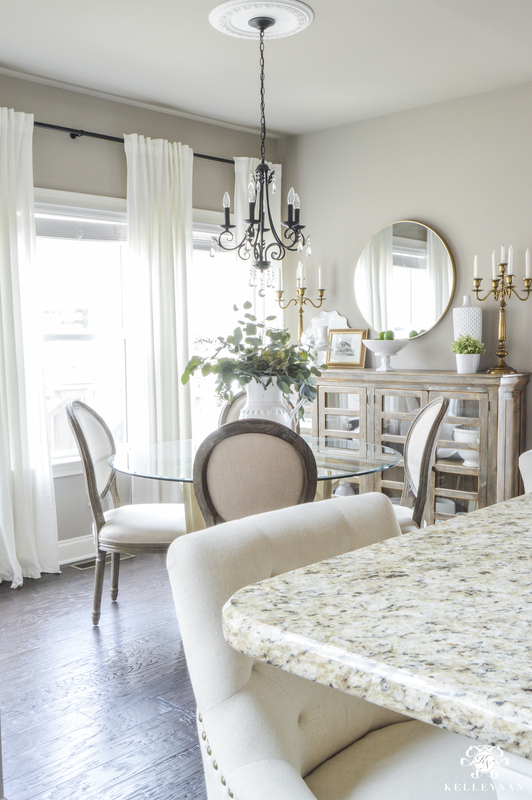 I love mixing styles in my home; you don’t have to stick to a specific theme and finish in a room to make it cohesive. 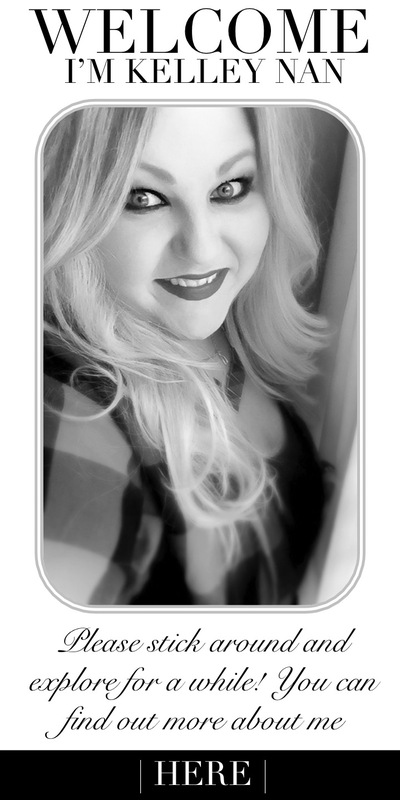 I can’t even tell you how much I LOVE the new mirror!! WOW! What a difference! Great job Kel! Tam, thank you! Now, onto the next project! Shauna, thank you! Crazy what one little thing can do! Lynne, thank you! Absolutely. I have them linked at the bottom of the post or here: http://bit.ly/2ixB5Gk Right now, they are on sale for $119! I love your barely-there mirror and how you’ve lightened up this room. It def says spring. And I thought the room was perfect before….but now I love, love how you have lightened up the love! Another beautiful makeover Kelley Nan! I absolutely LOVE LOVE LOVE the changes Kelley! It’s so much lighter and fresher. You continue to inspire me to make some changes in my home. Mara, thank you so much for stopping in! I’m feeling super motivate- let’s tackle 2017 together! I love the new look! Your blog has now become one on my list of morning stops before leaving for work! Barbara, that just makes my day; thank you! Wishing you a wonderful Wednesday! Kelley I’m loving the new round mirror! So fresh and clean looking! I’m looking for a round mirror for my vanity and this would be perfect! Thanks for sharing! Kathy, thank you!! 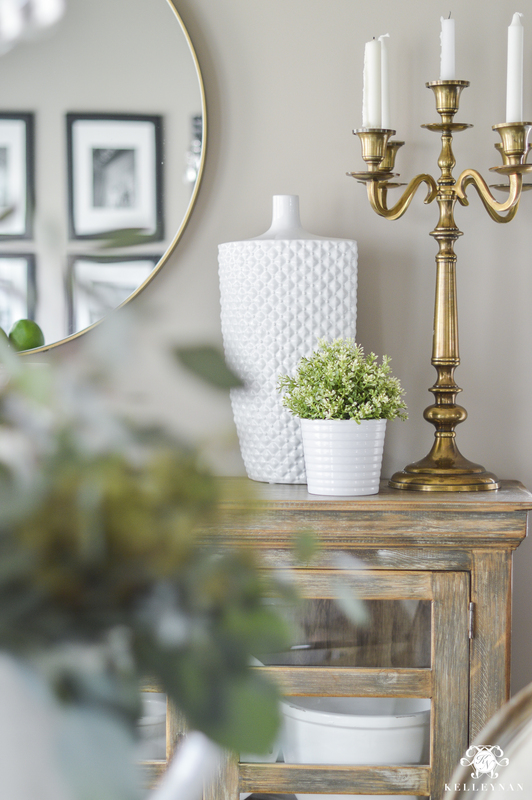 I am loving the clean look of big round mirrors- I bet that would look fab! Teri, thank you!! I am so enjoying the new, lighter look! It looks great! Love the new look! Sue, thank you!! Have a fantastic day! Kimberly, what an incredible compliment- thank YOU for taking the time to visit! It is Perfect Greige by Sherwin Williams. Depending on lighting, it can appear darker/lighter beige/gray. 😉 Definitely test first! I just ordered the curtains, did you use the hooks amazon recommends or are they hung directly on the rods? Your taste is exquisite! You have a gift for “beautiful”. Thanks again! I simply cannot BELIEVE the difference that mirror made — and I LOVE it! 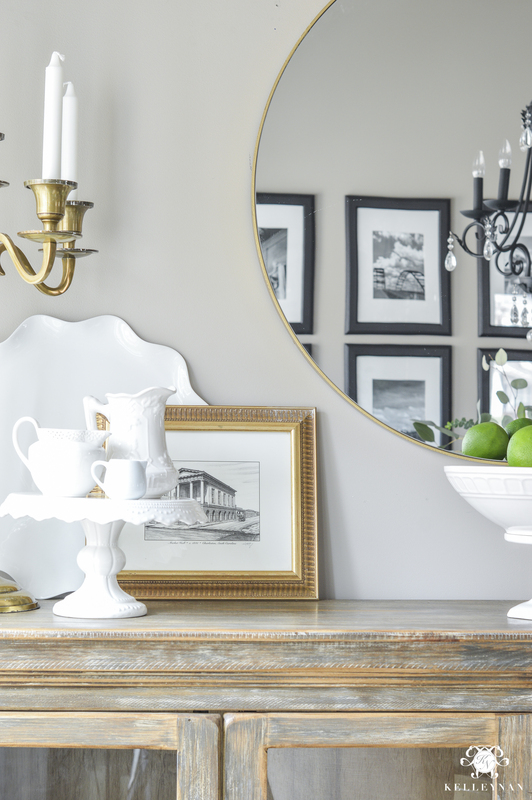 The original mirror sort of overshadowed the beautiful, clean lines of your buffet — it really stands out now. Oh, the inspiration you have caused! Hi Kelley, the refresh/update looks great! Its amazing how one tweak can have such an impact. I’m curious though about your curtains. I believe they’re IKEA? Have you been pleased with them? I’m assuming so since they’ve stayed the same. I’m looking to replace the ones in my bedroom but didn’t want to spend a huge fortune. Deborah, they are and I have! And, the price can’t be beat. IKEA is actually over an hour away (and I despise going through that maze) so I purchased online here: http://amzn.to/2iBaB6J They are eligible for free shipping so to me, it is worth the few extra dollars. But, if you love going to IKEA, go for it! Thanks so much! The closest IKEA is three hours away so it will definitely be an online purchase (thanks for the link!). You have these in one of your bedrooms too, right? You’ve convinced me! They’re ordered! Bree, thank you sweet friend!! I still have other travel prints I need to find homes for! The mirror definitely lightened up the look of the room. 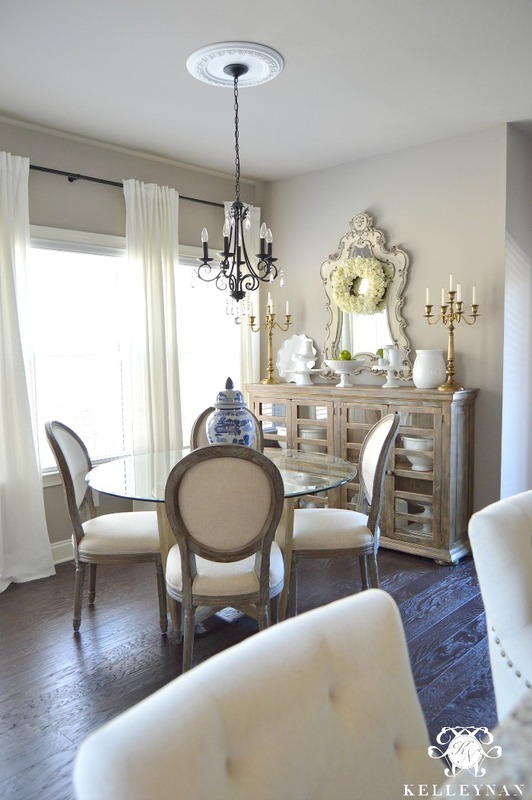 I would probably paint the chandelier gold or go with a white-washed airy french chandelier to complete the look. I normally like something dark in the room to anchor it, but in this case, I think it seems out of place. Great new mirror Kel! You definitely achieved your goal…the room looks much lighter. Love it! I love the new mirror! 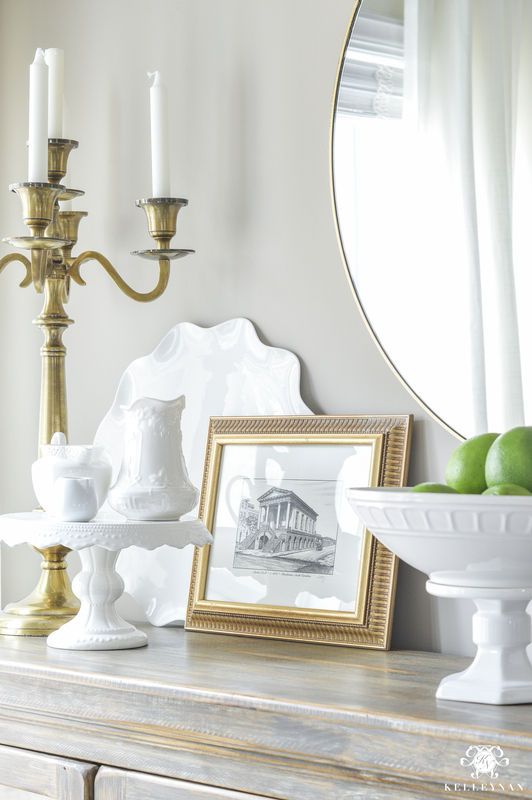 Even though it’s not as elaborate a mirror, it makes more of a statement. 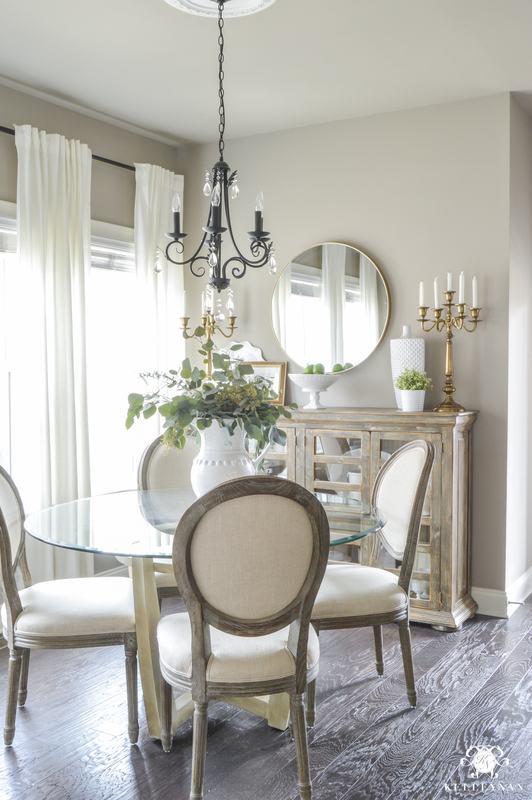 And, the white decor lends a fresh, less is more look. So happy you removed the too small round carpet, as well. Your new chairs, being lighter than the old suit the space. 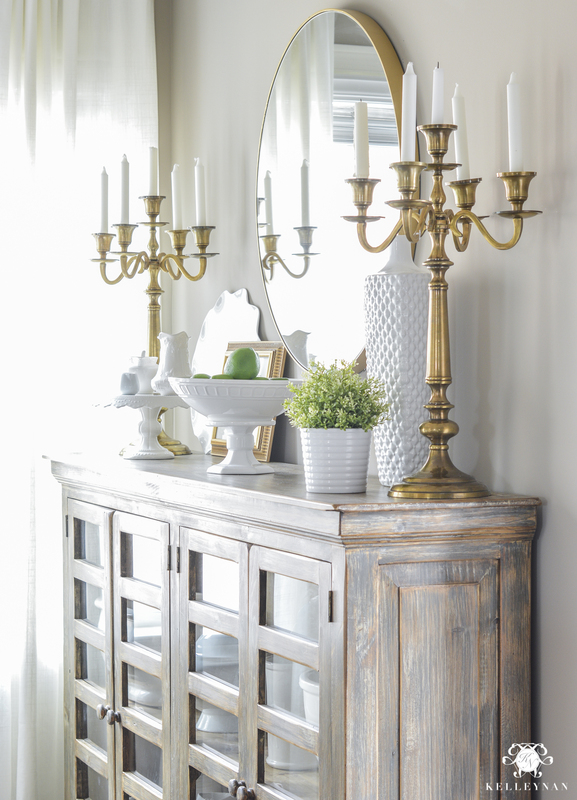 Your mix of modern and French country have hit the right balance to be young and refreshing but still homey. Joanna, I am enjoying it! Thanks for stopping by. Hey, Crystal! I had to put away all the straight winter decor like snow branches but do still have some pinecones around 😉 I would concentrate on universally season-appropriate pillows, minimize some of the mercury glass (if you have any) and think about bringing in a plant. This time of year is always tough! I am so glad to hear that about the curtains; I can’t believe how amazing they look and feel for that little! Love the new look it’s light and airy you are ready for spring. Proves the theory that if you buy what you love, you WILL find a place for it! Really like the new mirror and I agree that it looks lighter and gives the buffet more presence. So so true! Thank you so much for visiting with me! I love it! The room looks great. Love the new mirror. However, I think the candelabra’s are too large and overpower it. Vi, aw, the candelabras are still one of my favorite parts! I’ve just recently started following and can’t begin to tell you how much I love your style. Loved the first look, love the new look. Ok, so I love everything!! Thank you for sharing your home, ideas and talent. Very inspiring to look at small changes that can be huge. Very helpful and thank you! So fresh and bright! beautiful. It’s interesting, because the first look was great, but when you lightened it up, it felt like I could breath a little easier. I think removing the circular rug helped a lot also. That mirror is definitely on point! I just bought, I believe, the same one for my ensuite reno. Love the simple lines of it and it is the perfect colour gold I was looking for. Love your blog and follow you on ig. Your honesty and style are much appreciated. Lisa, thank you so much! I just discovered your website, and I’m in love with your inexpensive makeover. Its so beautiful and refreshing, I absolutely love the buffet do you mind sharing where did you purchased it form? Everything is just so well put together! Thanks you in advance..
Lucy, thank you so much! The buffet was actually a HomeGoods find a few years ago. From time to time, they have big pieces for a steal! This is stunning! I love the paint color with the white and gold accents! Do you recall the name of this paint color? Hey there! fist time stopping by. I LOVE your style! We are looking to purchase a new fixer upper home and i love the paint color on your nook walls. Can you tell the name of the paint color? and also tell me if it carries any pink undertones? My biggest fear is choosing a paint color with pink undertones and end up hating it. I don’t see any in the picture but just want to make sure. Never know with lighting:) Hope to hear from you soon! 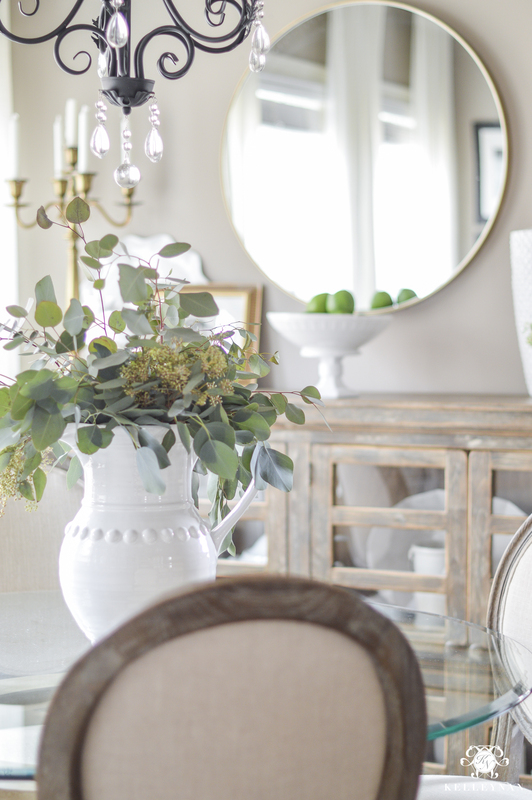 Hi, Chelsie- it is Perfect Greige by Sherwin Williams – I have a full post on my paint colors and thoughts here: https://kelleynan.com/the-comprehensive-list-of-paint-colors-throughout-my-home-plus-my-honest-review/. It CAN have a tinge of purpley undertones so if you don’t like that, I would go with something else. Also, make sure you test test test!